You know those things on your list that just always seem to be pushed to the bottom and you're always like "Oh yeah, I will totally do that soon!" ? But then you never do? And then you realize later that you never did ? Whoops. 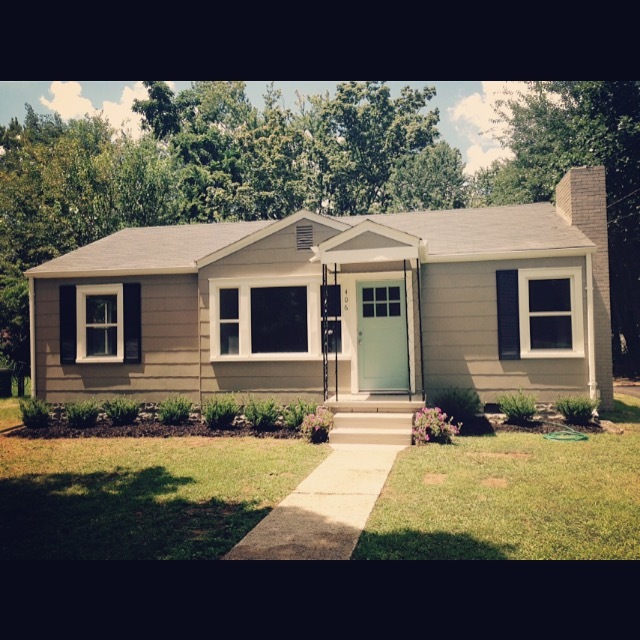 I am here to introduce to you House Flip # 5. And I know what you might be thinking right now.."wait, I never saw completion pictures from House Flip # 4." And you would be correct in that thought-- not because I failed to report them-- simply because there are none- The excitement and work the Escape Game has required has taken our focus off of Flip House #4- Simply because it will require a totally gut job of the house and it is impossible to be fully present and well devoted to two heavy projects at one. Then enters Hawk-- Aka Flip House # 5. A short while ago we met a neighbor behind us who was working on his house to sell. He has owned the house for several years and rented it out. The higher neighborhood prices had enticed him to fix it up and sell it. So, we asked him to let us buy it. And he did. Now, he had completed most of the inside work when we bought it-- its just needed an outdoor facelift. Because it was a much smaller project than normal, we dove right in and thought we could juggle it along with the other. It has worked out so nicely! So.. I realized when I was taking my "after" pictures that I had never taken "before" pictures. And I thought to myself "Well, This is Disappointing." Naturally, I pulled a google street view of the house and because it was so hilarious, I felt the need to show it to you guys. This picture is a few years old, but the exterior is pretty much the same as it was on the day we bought it-- minus the picnic going on in the front yard. There are so many fun things about this picture. Is it just me or is it awkward that this "picnic" includes a bunch of people spread out all over the place? Do they hate that girl?! Is that why they made her sit at the picture table so far away?! I just feel sorry for her! We just put this baby on the market and are hoping for a quick sale! THEN, You will get some more pictures of Flip House # 4 :) Promise!